Availability OUT OF STOCKGround shipping guaranteed 3 days or less for contiguous US! for Smocking Pleater Machines, Glossary, Directions, Fabrics, Maintenance, Table of Contents, 1983 Original*A Comprehensive Guide to the Use of the Smocking Pleater. Revised 1993-1994. From The Heirloom Collection. Pleater Manual "the Bible" of pleating! Can't live without it! Find every answer to every question you ever had about pleating with pleaters! This is THE definitive guide to operating a smocking pleater and working with pleated fabric. Written by an expert in smocking, Saran Douglas gives you more information than you ever would want to know about pleating and working with pleated fabric. Covers the basic subjects and then goes into a comparison of the popular brands of pleaters and advanced subjects like pleating on the bias and curves. Included is a glossary of terms, pleating directions for all types of fabrics and pleater maintenance instructions. The layout of the book is set up as lesson plans on every type of pleating, exotic or regular. She certainly did her research well and it definitely shows. I recommend this book as a must have in every smockers library especially if you like to know the scientific (well almost) technical stuff of how a pleater works and the comparisons between the different pleaters on the market. Which end of the needle is bending? It is the shank, it doesn't matter; it can't effect the pleating. All the shank does is hold the pleats until you pull them off. It is probably caused by piling too much fabric on the needles and pulling it off too brutally. If it is the point, it matters. Bending points are often caused by hitting too many or too heavy seams. The blunter the tip of the needle, the worse the problem because the needle doesn't go into the fabric easily. This ends with broken needles, as we all know. If threads wrap around the end of the gear shaft, they push the gear out of alignment with the others. Then the needle hits the "tooth" of the gear instead of the gap. If you are lucky, it breaks. If you are not, it bends. And bent needles tend to put large holes in the work. First practice on gingham to learn where your pleater takes a shallow pleat, where a deep one. See pleating lesson 1 in The Pleater Manual. It describes how to adjust for the action of the pleater. Then press folds into the good fabric to be pleated, folds perpendicular to the pleats. Put them perhaps every 6" or even every 4" so you have something against which to judge what is happening the way you do on gingham where your goal is to keep the pattern going into the pleater evenly. I sometimes pull a thread at the upper edge, where it will be in the seam allowance, so I have a guide for a needle to follow. The folds and the pulled thread give you both horizontal and vertical guides. They show when you are getting off the grain the same way the gings do. You can always press folds to use as guides if they don't show when the garment is finished. What pleater are you using? How many rows? Where is it skipping? Middle? Ends? What are you pleating when it skips? What were you pleating when it started skipping? How heavy, how light? Soft? Stiff? Where do you hold the fabric? How do you guide the fabric? Grip a dowel in the center and pull? Did you drop the machine? Have you cleaned it recently? Maybe something like a knot of thread is holding the gears out of position? Are there threads wound around the gears? Jerry Kooistra, who manufactures the Amanda Jane pleaters, says that all of the gears of all of the pleaters bow a bit under stress. He is trying to counter this by cutting the center grooves a little more shallow than the end ones so the needles won't have as much play there. They do the last shaping of the gears by hand at his place, straightening them with padded mallets and "gentle" taps. I cringe at the idea of do it yourself on this one. Perhaps a local machinist who would have something VERY straight to work against and an understanding of what safely could be done to metal. Try rolling the gears, all of them, on the flat-est surface you can find - a counter top, for instance, and see if they touch the surface all the way along, all the time. If not, it is the gears. Start calling machine shops. If they are straight, see page 25 about how to judge the quality of the needles you are using. If the points are very different shapes, it can contribute to the problem. If it is the pleating technique, see lesson 1 on how to control fabric while you are pleating. If the fabric is pulled taut away from the gears, the needles can't pick it up, which would result in skipped pleats. The finished ratio of pleated fabric to flat fabric depends on how tight you stitch it. The stitching tension is always variable æ deliberately, one hopes. A 36" width of fabric pleated on an old Read or Newell, usually yielded 4 pleats to the inch of fabric, 144 pleats. On the Amanda Jane(s), one gets about 151 pleats from the same amount of fabric; the Stanley will put 136 pleats across the same fabric. If the design uses 140 pleats, the Stanley will not do the job. And if you are doing a stacked cable design and your tension is tight, the "required (by the design)" number of pleats may well not spread to fit the garment. If 140 pleats are used in a design in wave stitch, it may be too loose for the garment. To find how many pleats a machine gets to the inch, pleat at least 20" of fabric and count the pleats. Divide the number of pleats by the inches of fabric. The information is useful only if it is balanced against your own knowledge of your smocking tension. 80 pleats divided by 20" = 4 to the inch. 45" of fabric should yield 180 pleats. There is nothing to do but adjust your tension to the amount of fabric or the fabric to your smocking tension = tight tension: increase the amount of fabric you are using or change to a more flexible design. to fit the design and stitch tension. if you smock loosely, cut the amount of fabric down or use a design with tighter stitches. Van Dyke stitch produces a quite reliable 3:1 ratio of starting fabric to stitched results. Stacked cables tend to run 4 or 5:1, starting fabric to finished stitching. Needles break under stress. The problem is usually that the needles are being pushed out of position by threads wrapped around the gear shafts. Clean the pleater. Sharpen the needles. Run wax paper through it to "grease" them. You can pleat anything you can get into the pleater. I've done window screen (wire, without needles; the gears put the pleats in, not the needles, and the wire holds the pleats. And plastic window screen (with needles and thread; the plastic doesn't stay pleated by itself.) The needles tend to cut the threads of the screen, so smock a pattern that will hide the broken threads. Yes, you can pleat velveteen. Work with it (and corduroy) fur-side down so the pleater picks up the backing of the fabric. If the needles run high in the grooves, and the fur is up, all the needles will pick up is the fur, and out the pleating comes, the fur with it. Anything else can be pleated either side up and it makes no difference. Mark guides with chalk (ON THE BACK) instead of pressing folds to keep the pleating straight. Velveteen is really bulky when it is pleated. Choose a design that lets you use minimal fabric and stitches that spread easily. If you cram too much fabric in you will get a suit of armour instead of a dress or romper. Nesting the needles will tell you if some of the points have been deformed. Deformed points sometimes cause skipped pleats. But the other big clue is to feel the points of the needles and see if they are blunt or have burrs on them & little stand-up bits of metal. Blunt needles make major holes in fabric and on tight weaves or seams, often break. Pull blunt needles over knife sharpening block or across very fine sand paper until they are sharp again if you don't have new ones to put in. It is hard on the plating of the needles, but it works for a while. For more detail, see the section (The Pleater Manual) on caring for a pleater, pages 24 and 25. If it is consistently one needle that is skipping, hold the top, big gear down a little bit to keep the needle from rising too high above the fabric. Press down and toward the center of the pleater. See words and drawing on page 32, but put your thumb on the top gear instead of the removable gear. Read Pleater - what brand of needles will fit if Read needles are not available? Which Read pleater? The 16-row Read can use needles for the Pullen and Newell. (Does Newell still exist?) The 24- and 32-row Reads use the same needles as the Princess from England. Nothing else fits. Good luck. It makes no difference at all to the pleating whether the fabric comes from under or over the dowel. Nor does it matter to the end result which side (right or wrong) of the fabric is up. I usually work with the project right side up because if it is at all tricky, that is the side that must look perfect and perfect is easier if you can see what you are doing. Having the fabric come over the dowel means that you can see more of the fabric at a time, which is often a help. I also need to do things a bit differently since I had my husband make me a board to fasten my pleater down with the spools on dowels to make it easier. The board extends out the same direction as the needles do. I do most serious pleating with the needle-side of the pleater away from me, gear-side toward me. If you have spools between you and the pleater, you are way back from the fabric and turning the pleater gear-side toward you should make it easier to control the fabric. See the General Advice section, pages 8-13 and on. Well, you are probably using a 24-row pleater and working in the middle of it, and the fabric is harder to control than most, because of the slubs. They do change the weight of the fabric in an uneven manner. They can be the cause of the missed stitches. Hold the top gear down gently while you work (see one of the previous answers for how). Why is because the slub spreads the gears a tiny bit and lets a needle near it rise higher than the fabric is folded for a pleat (see pleater similarities, page 3 and differences, page 4). To have a chance to cure the problem, you need to work with a piece of material wider than the pleater so you can control the fabric better ñ it needs to be straight as it goes into the pleater. Press guide folds, maybe only 4" or 5" apart, so they will be perpendicular to pleating threads, parallel to the pleats. See Lessons 1 and 2. Because of the slubs, the pleater takes very varied depths of pleats. It wants to compensate ñ to make them all equal, but it can't. The problem is exaggerated beyond the normal uneven bite the pleater always takes. If you don't have enough fabric to cut another piece, wider than the pleater, sew extensions to this piece. Stitch strips flat along the long edges. Maybe zig-zag them with a wide stitch. Avoid bulk. Thread all the needles and pleat the extensions too. And keep pulling the fabric taut, parallel to the gears, before it goes into the gears. If it sags, the pleater will make what ever adjustments it thinks are necessary, making it all wave again. The pleater manual a comprehensive guide to the use of the smocking pleater revised 1993. The pleater manual a comprehensive guide to the use of the smocking pleater. ... smocking pleater by sarah. . Pleater manual guide to the use of your smocking pleater machine sewing. 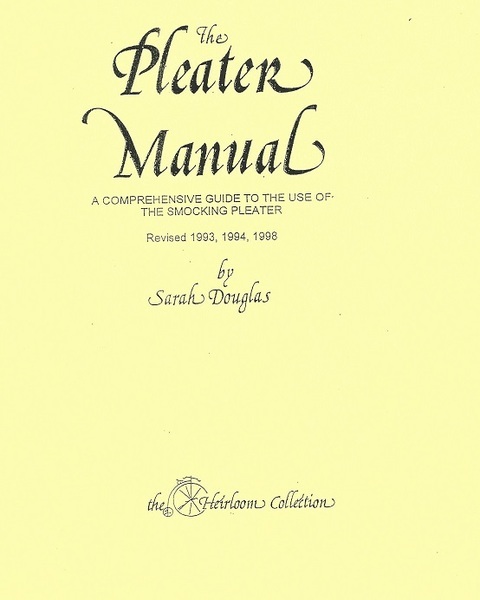 The pleater manual by sarah douglas. The pleater manual guide to smocking pleater by sarah douglas. The pleater manual a comprehensive guide to the use of the smocking pleater. The pleater manual sarah douglas smocking pleater 1993 heirloom collection. The pleater manual guide to smocking pleater. Pleater manual smocking machine book 72 pages by sarah h.douglas 1983/93. The pleater manual guide to smocking pleater by sarah douglas. The pleater manual guide to smocking pleater by sarah douglas. The pleater manual by sarah douglas 808hc p 14 00 see book description. Product 1009473 price 25.99 plus shipping. The pleater manual guide to smocking pleater by sarah douglas. Read smock gathering machine the pleater manual by sarah douglas. A z of smocking a z embroidery series . Pleater manual a comprehensive guide to the use of the smocking pleater. Steam railway magazine august 1989 uk publication strange tale of the other black 5 fifteen guinea special black 5 44781. The works of louise muhlbach salesman s sle book 1867 d appleton co with several color plates. The pleater manual by sara douglas. Soodlum s irish ballad book 1982 soft cover words music and lots of black and white photos get ready for st. patrick s day. Graded materials for the pipe organ james h rogers 1927 training booklet wonderful vintage sheet music. Railway magazine back issue august 1976 uk publication locomotive green goddess. Items in the worthopedia are obtained exclusively from licensors and partners solely for our members research needs. A complete manual for the beginner through advanced smocking techniques describing in detail over 120 stitches. Indy car design development of the indy car 1981 by roger huntinon marmon to mclaren shrike to chaparral perfect gift for the racing fan. Read original 16 row smocking pleater machine, free 30 1hour perfect pleats dvd video,. Power pleater, motor drive, for amanda 16 24, new read 16 . having road tested other makes of pleaters, i settled with the princess pleater. it is well designed, sturdy, practical to use, versatile, has two turning. Vintage 1937 lumbys solar boilers radiators hardcover catalogue wonderful vintage reference piece. Knit and crochet accessories for tots and toddlers patons book 402 wonderful vintage patterns booties slippers mitts hats. Sally stanley 24 row smocking pleater / pleating machine sssp . Roden bros rich cut glass catalogue and price guide 1917 1974 reprint great glass reference piece. Here is pretty and easy technique that is great when you prefer not to have the. Amanda jane fs 24 row super smocking pleater machine nla accessories only at allbrands.com. ... smocking pleater by sarah. .
Sallly stanley pleater needles. 1970s knitting and crocheting pattern book for ponchos and accessories styled by hilde fashions in wood. Vintage read pleaters smocking pleater 16 rows with box instructions. Pullen pleater needles 091 pn p . Amanda jane fs 24 row super smocking pleater machine nla accessories only. Buff a collie and other dog stories by albert payson terhune wonderful children s adventure. Servo pusher bar pleater 9pbp2. Latvju zeene latvian hand crafts magazine 1950s traditional designs herbal dye recipes text in latvian. Antique american machine cast iron brass fluter crimper table pleater no handle. Techniques guide to machine smocking. ... smocking pleater by sarah. . Instructions for the pullen pleater. Beginning smocking by michie mooney. The pleater manual guide to smocking pleater. . Price 39.95. quantity requested. Pleater instructions wrong side of fabric is up when running thru pleater!. The pleater manual a comprehensive guide to the use of the smocking pleater sarah douglas amazon.com books. Four whistles to wood up! by frank walker canada west ontario railway history 1953 vintage softcover book. If you have never used a pleater before know that it is not difficu and is certainly less time consuming than the iron on dot method of forming pleats. Read, 32, needle, row, new, style, smocking, pleater,. The amanda jane smocking pleater with thread caddy and carrying case. . Amanda jane super 24 row smocking pleater new. The only new pleater available! consistent quality for more than 60 years. This is our 2nd purchase and we are sold on your company!!! I am extreamly happy to find your company, this was fantastic, great service, thanks. I really appreciated the step by step instructions of how to pay using my paypal account. This book needs pictures and more description on the site, It's great and I think that it should have a blurb that it is recommended reading for anyone contemplating buying a pleater without personal guidence and not having access to a real pleater. I put the cart before the horse by buying a pleater without reading this book first. I still would have bought the pleater that I did purchase, but I would not have put the needles in wrong. In all fairness, the sew forum did recommend reading this book before buying. I just did not understand why reading a book would make the whole pleating experience more enjoyable. Shipping, woo-hoo through a snowstorm! I expected it to take longe! r but the delivery was very quick.